Confederate is a planned American television and alternate history drama series set in a timeline where the American Civil War ended in a stalemate. David Benioff and D. B. Weiss are developing the series for the network HBO. The two previously developed the HBO series Game of Thrones. The announcement of Confederate was followed by anger and criticism on social media with some describing it as "slavery fan fiction", leading to the hashtag #NoConfederate, which trended number one in the United States and number two worldwide on Twitter. Show developer David Benioff said he was inspired to explore this concept by "the famous story of when Robert E. Lee was invading the North. Not the Gettysburg invasion, but an earlier one. And the set of orders got misplaced and were found by a Northern soldier. And it ended up ruining Lee’s invasion. A lot of people think if the orders hadn’t been lost, things might have been different: The Confederates might’ve sacked Washington, D.C., it’s possible the South could’ve won the war". Co-creator D. B. Weiss added "it goes without saying slavery is the worst thing that ever happened in American history. It’s our original sin as a nation. And history doesn’t disappear. That sin is still with us in many ways. Confederate, in all of our minds, will be an alternative-history show". D. B. Weiss and David Benioff are the creators of the series. 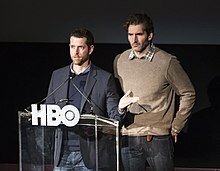 On July 19, 2017, David Benioff announced that he and D. B. Weiss would begin production on a new HBO series, titled Confederate, after the final season of Game of Thrones (2019). Benioff and Weiss said, "We have discussed Confederate for years, originally as a concept for a feature film... But our experience on Thrones has convinced us that no one provides a bigger, better storytelling canvas than HBO." Joining as executive producers will be Nichelle Tramble Spellman, Malcolm Spellman, Carolyn Strauss and Bernadette Caulfield. The series will be written by Benioff, Weiss, Nichelle Tramble Spellman and Malcolm Spellman. The Spellmans, who are African American, indicated initial hesitance to work on this project before concluding that the show would benefit from having black writers. Malcolm Spellman stated “Me and Nichelle are not props being used to protect someone else,” adding there would be “no whips and no plantations” in this show. On February 6, 2018 Lucasfilm announced Benioff and Weiss as the writers and producers of a series of new Star Wars films, to begin production "as soon as the final season of Game of Thrones is complete", casting doubt on if and when Confederate would be produced. In April 2018, Variety reported the future of Confederate is uncertain. In July, HBO president Casey Bloys confirmed the series was still in development, and hoped it would resume once Benioff and Weiss finished their ongoing commitments. Upon announcement, Confederate received backlash on Twitter over its featuring a modern-day Confederate States in which slavery is legal. April Reign, who created #OscarsSoWhite, created #NoConfederate, which became the number one trending topic during the airing of an episode of Game of Thrones. Jake Nevins of The Guardian was concerned the show would act as wish fulfillment for white supremacists. He also cited the lack of diversity on Game of Thrones as a foundation for their concerns. Reign questioned the intent of the show, asking: "Who is the intended audience? It can't possibly be black people, right? Because then what you're saying is, 'Hey, black people, we know slavery is bad, but we want to show you how bad it was'." Commenting on the parallels between The Handmaid's Tale and Confederate, Reign described them both as voyeuristic saying “Let's open up our wounds so that people can heal, and yada yada yada. But Handmaid's Tale isn't doing that. It's this sick sort of voyeurism about the subjugation of women." The Guardian reported that announcement of the show lead to "widespread anger on social media". MSNBC host Joy Reid commented on the show saying: “It plays to a rather concrete American fantasy: slavery that never ends, becoming a permanent state for black people. Repugnant." Ta-Nehisi Coates, writing for The Atlantic said "African Americans do not need science-fiction, or really any fiction, to tell them that this 'history is still with us'." Author and activist Roxane Gay described Confederate as "slavery fan fiction" adding "if it's not being made for people of color, then that means this is made for white folk. Why, as a white person, would you want to see that unless it appeals to your base desire to see people enslaved and in pain? Weiss and Benioff with executive producers Nichelle Tramble Spellman and Malcolm Spellman, both of whom are African American, defended the show in an interview with Vulture.com in which they asked critics to defer judgment until the show airs. At the Television Critics Association press tour, Casey Bloys acknowledged that the announcement of the show was poorly executed, but stood behind the decision to green-light the show. "HBO has a long history of championing intelligent storytelling and we will approach this project with the same level of thoughtfulness that has always defined our programming. We recognize the sensitivity of this project and will treat it with the respect that it deserves. Our creative partners should be given time to develop the series rather than face prejudgment." In February 2019, Bloys said the series was still in development and not affected by the controversy. ^ a b Petski, Denise (July 19, 2017). "'Game of Thrones' Creators Reteam with HBO on 'Confederate' Alt-History Drama Series". Deadline Hollywood. Retrieved July 19, 2017. ^ a b c d e Nevins, Jake (August 1, 2017). "Confederate: will a grassroots movement sink the controversial HBO series?". The Guardian. Retrieved August 10, 2017. ^ a b Reese, Hope (August 4, 2017). "Meet the activist who wants to stop HBO's Confederate from getting made". Vox. Retrieved May 15, 2018. ^ Jensen, Erin (July 31, 2017). "#NoConfederate trends as #OscarsSoWhite creator hopes show won't see 'light of day'". USA Today. Retrieved May 15, 2018. ^ a b c Hibberd, James (July 19, 2017). "Game of Thrones showrunners reveal their next epic HBO series". Entertainment Weekly. Retrieved July 20, 2017. ^ a b Adalian, Josef (July 20, 2017). "The Producers of HBO's Confederate Respond to the Backlash and Explain Why They Wanted to Tell This Story". "Vulture" web site. New York. Retrieved July 21, 2017. ^ Controversial HBO Series ‘Confederate’ Unlikely After David Benioff & D.B. Weiss’ Commit To New ‘Star Wars’ Movies Deadline. February 6, 2018. ^ Holloway, Daniel (April 25, 2018). "'Here And Now ' Cancelled by HBO". Variety. Retrieved May 15, 2018. ^ Ausiello, Michael (July 25, 2018). "HBO's Confederate Still Has a Pulse". TVLine. Retrieved July 27, 2018. ^ Coates, Ta-Nehisi (April 4, 2017). "The Lost Cause Rides Again". The Atlantic. Retrieved May 15, 2018. ^ Chavez, Danette (July 26, 2017). "HBO president: Confederate announcement was a blunder, but show is worth the risk". The A.V. Club. Chicago, Illinois. Retrieved August 10, 2017. ^ "I fear HBO's Confederate could be a flag waver for today's neo-Nazis". The Guardian. August 21, 2017. ISSN 0261-3077. Retrieved August 21, 2017. ^ Bell, Gabriel (August 15, 2017). "After Charlottesville, HBO doubles down on "Confederate"". Salon. Retrieved August 21, 2017. ^ Roots, Kimberly (February 8, 2019). "Confederate Delay Is Independent of Controversy, HBO Boss Says". TVLine. Retrieved March 31, 2019.